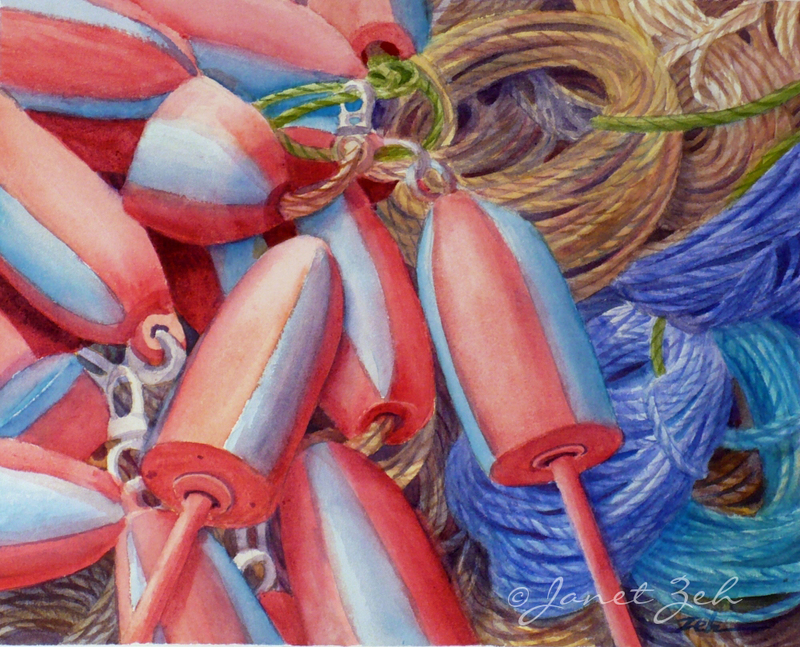 "Fishing Buoys" original watercolor - for sale in my Original Art Shop! Red and blue buoys lay atop colorful coils of rope in a harbor at Block Island, Rhode Island. I can almost smell the salt air just looking at this scene. This highly detailed piece was created by first doing a careful drawing from a photo taken at the island. Multiple layered washes of color were added to shape the rounded form of the buoys and ropes. Then cast shadows were washed over these layers in the appropriate areas. The final step was to paint the details of the twisted rope and add the darkest details to suggest depth. It took time, but the final result was worth it!